Fifty degrees is apparently the magic "bees become active" number. Yesterday, they weren't out at all during the morning and I knew the magic number so I didn't think anything of it. Then, around 1p, I came into the bedroom and was shocked. 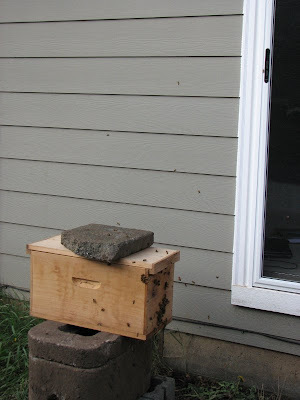 Outside the glass door, I had a whole bunch of bees buzzing around in the sunlight. I was worried they were swarming again at first but then I saw them going in and out of the entrance and there were really only about a hundred out. You can sort of see some against the backdrop of the house but photography doesn't really do it justice. They kept it up until about 5p. From that point on, the activity decreased as the sun got lower and lower and the temperature dropped. It was funny watching them go in and out. It reminded me of a subway station at rush hour. A whole rush would push into the entrance and then the moment there was a slight break there would be a push from inside out. They kept taking turns like that all afternoon. My theory is that they were all kind of just hanging out near home trying to get their bearings so they could find their way's back to the hive after longer excursions. I did see some flying back over the fence from the farm and also saw some sampling the cherry blossoms that are almost above the hive. I also got to see several sitting on the face of the hive and scenting with Nasarov pheremone. Apparently, they use it to mark "their" hive. The sit and expose the underside of their abdomen (where the gland is) and move their wings really fast to fan the scent. I need to find more info on bee behavior. Interesting stuff. 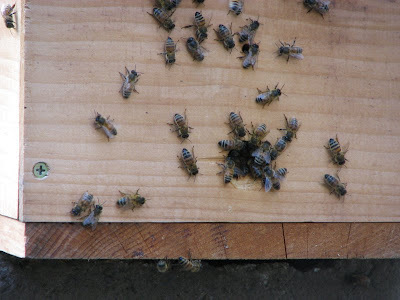 By 6p, when we returned from the beekeeping store with all of our new supplies, the activity above was only a memory and one by one the last foragers were returning to the hive. 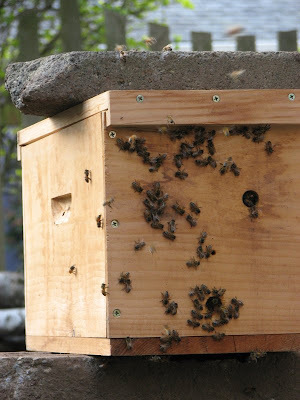 Only one dim-witted bee ended up outside on the box overnight. She kept trying to get into the crack at the top where the lid meets the box. Natural selection at work. Looks like one dead little bee statue on top of the box this morning. At Glorybee, we apparently lucked out because they got a shipment in yesterday morning after being completely out on Friday and Saturday. We got two deep supers (which will be their home that they always have the brood and winter stores of honey in), 20 frames, 10 sheets of comb for putting in the frames, a screened bottom board, a metal covered telescoping top, and a protein cube and top of hive feeder for getting them through the last rainy days of spring in their new home. We also got a veil and gloves for Q. We didn't get gloves for me because even the smalls were way, way too big. Apparently some online company sells children's bee gear so maybe I'll try them. Until that time, when I feel like I need to wear gloves, I'll just use some gardening ones. All of the hive gear is unassembled so Q's going to be doing some hammering tonight. I'll be handing him parts, as per my usual job of "lackey".